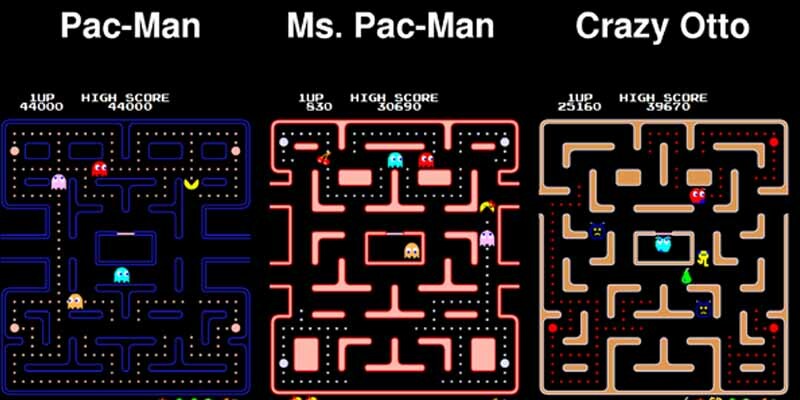 Ms. Pac-Man was the result of a collaboration between Midway and a General Computer Coropration founded by MIT dropouts. The said MIT dropouts were Kevin Curran and Doug Macrae, who made side money by setting up arcade games in the dormitory. To increase their profits, they decided to start making the games harder by making them more fast-paced and random. This was successful to the point where Curran and Macrae felt comfortable dropping out and starting the General Computer Corporation, specialized in making “difficulty kits” for arcade games. They made one for Pac-Man, but the titular character was given legs and renamed to Crazy Otto to avoid copyright issues. They then attempted to sell the difficulty kit to Midway, holder of the Pac-Man copyright, but instead Midway hired them to make a meaner and harder Pac-Man game, and that’s how Ms. Pac-Man was born.